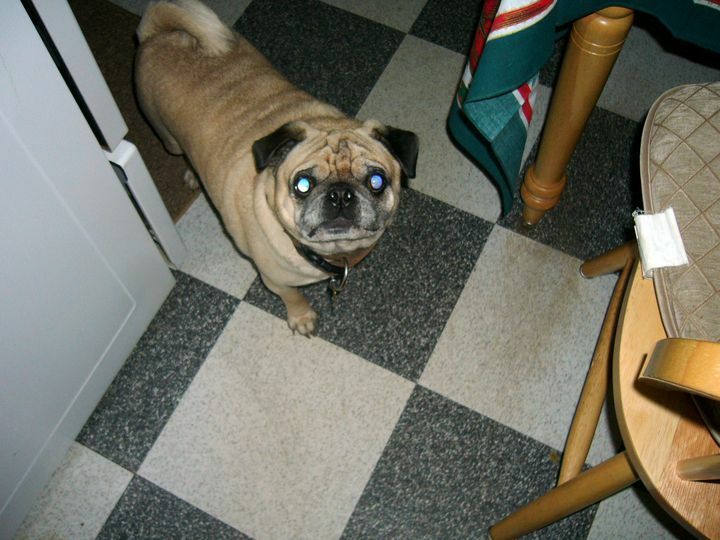 After the death of my pug on Christmas Eve, I wrote a blog entry talking about how much I’ll miss the little guy and how great it’ll be to have him waiting for me on the other side. Well, our resident poet Joseph P. Martino from Millburn read that entry and provided us with some verses to enjoy. Pets mean so much to so many people and Mr. Martino managed to capture that emotion very well in his poem. So please enjoy his latest offering on the site: Angels With Four Legs. Back and forth between the earth and sky. They never question the reason why? But, will give of their life, if do or die. For this I am thankful and full of pride. They aid and comfort the disabled and sick. They even employ a special trick. If the need arises, they will even give your face a lick. They just want you to pet them; it’s their only quirk. They never fail to greet you, what a beautiful sight! So be kind and loving to the very end. And will always remain faithful to the very end. Thanks, Mr. Martino, for providing some comforting words in a very depressing situation. This past Christmas season was filled with a lot of unhappy, unpleasant activities for me. At some point, I may write about my 23-year-old student from the fraternity who was hit by a van and ultimately died about a week before Christmas. It was very tragic and my heart broke for his family having to deal with the loss of a young son so close to the holidays. As you might imagine, I spent as much time as I could with the undergraduates that I advise in the fraternity in an effort to help them get through the loss of their friend and brother. It was a very difficult time and, again, I might write about that at some point in the future. In the middle of this student’s final services – which were held on Christmas Eve – my Mother called me in tears to tell me that she had to put down one of our dogs that morning. Folks, if you ever find yourself wondering how to make a bad day even worse, then find out that a family pet was just put down while you’re at a young person’s funeral (in the cemetery, actually). 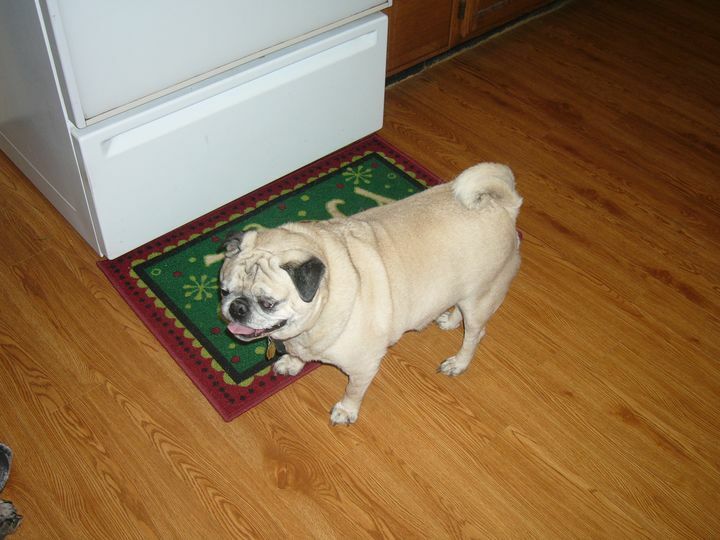 Before this dog – Odie – had to be put to sleep, my Mom had three dogs. But this dog was absolutely “my” dog even though he lived with my Mom. I rescued him from the Monmouth County SPCA several years ago and he never forgot that I saved him from the shelter. 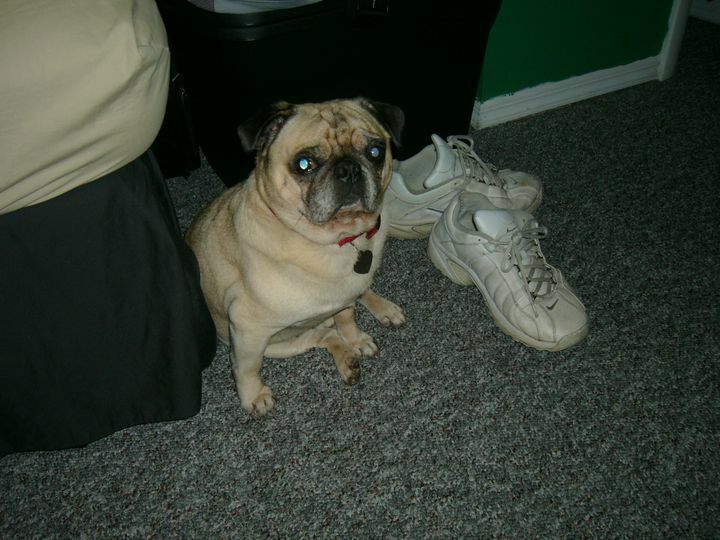 Whenever I would go home to my Mom’s house, Odie would get up and come over and sit by me no matter who else was around or whatever else was going on. 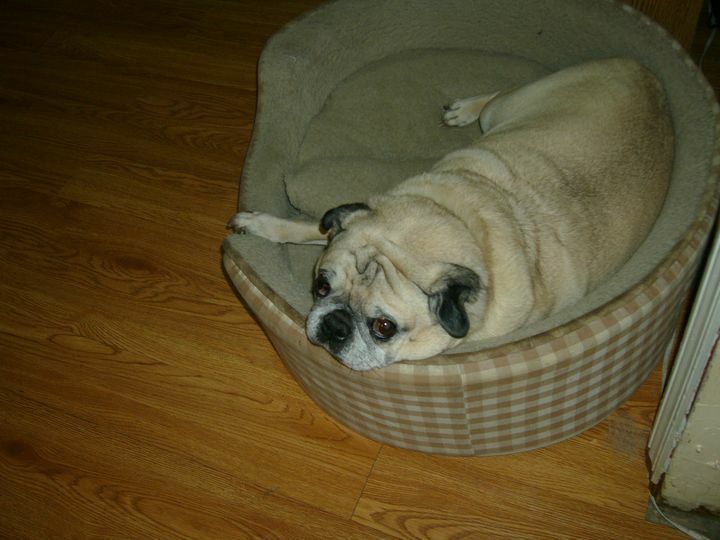 It’s a very sad thing to lose a family pet – especially one that was as loved and loving as Odie was to our family. I remember when I first saw Odie at the shelter. 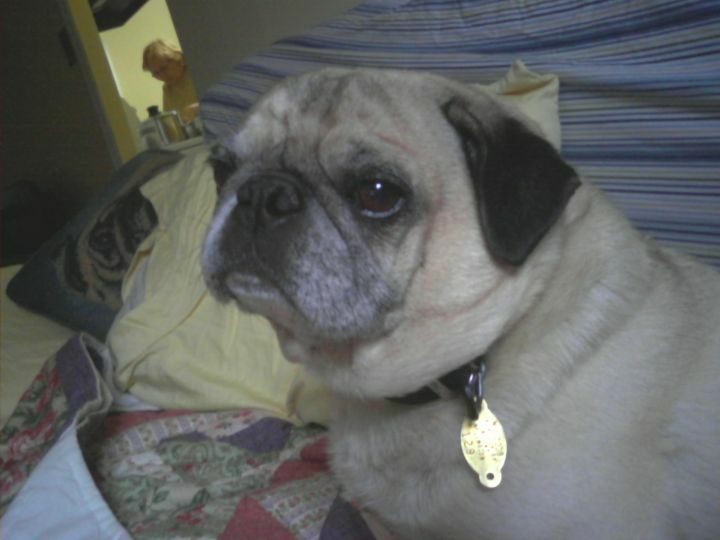 Earlier that day I looked online at the Monmouth SPCA website and noticed that they had a pug available for adoption. 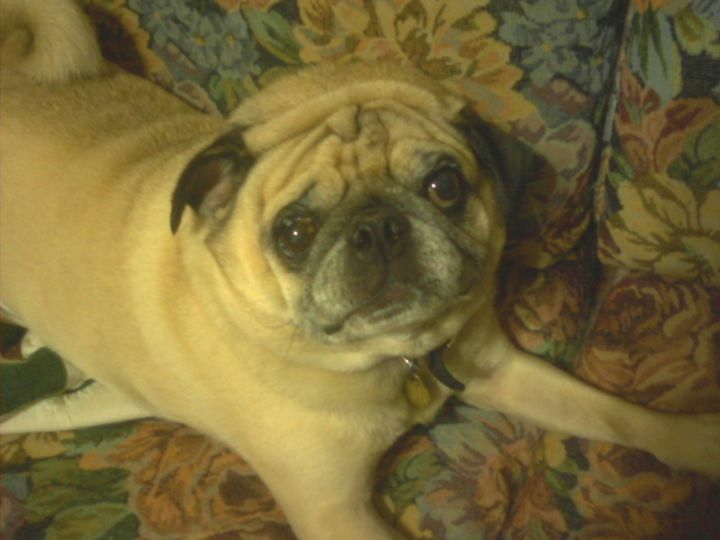 My Mom had been talking about getting another pug and finding one in an animal shelter is extremely rare, so I went over to the shelter and walked around for a while, but couldn’t find the pug. Just when I was getting ready to leave, I went down a hallway that appeared to be infrequently used and amid the stacks and stacks of empty cages, there was a note on a cage in the corner of the hallway. 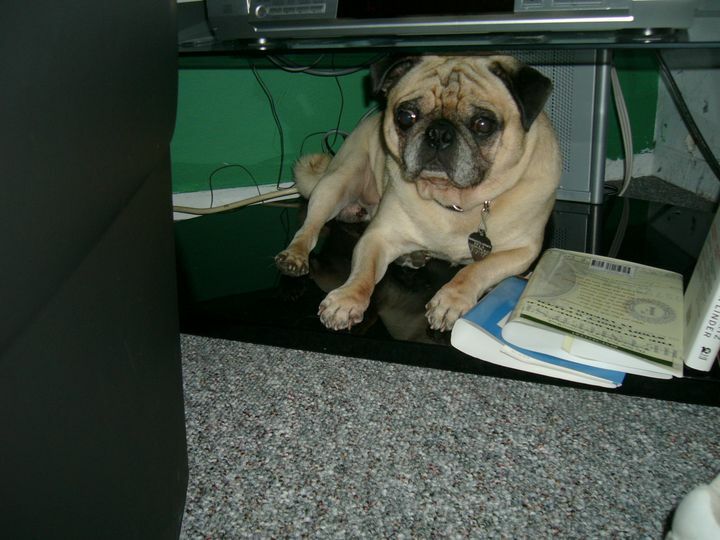 The note said “Pug – Odie” and I bent down to look in to see what was in the cage. 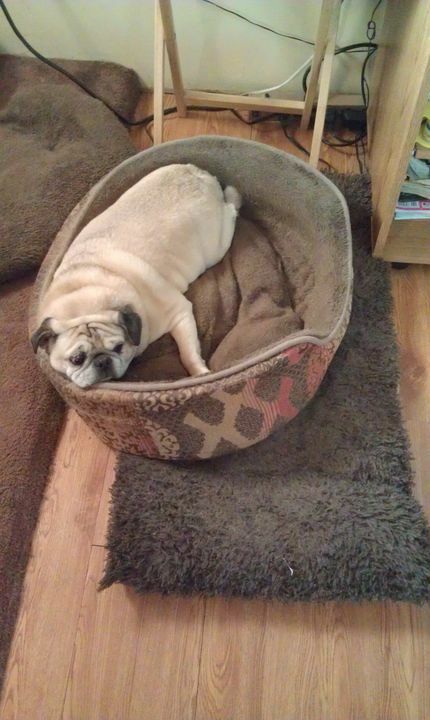 Lo and behold, there was Odie – skinny as could be and a miserable looking thing. He glanced up at me with the most pathetic, miserable, desperately sad look that you’ve ever seen and then put his head back down. Seeing an animal like that will break your heart on the spot. I got up and walked out of the hallway, went to my car, started it up, and drove away. 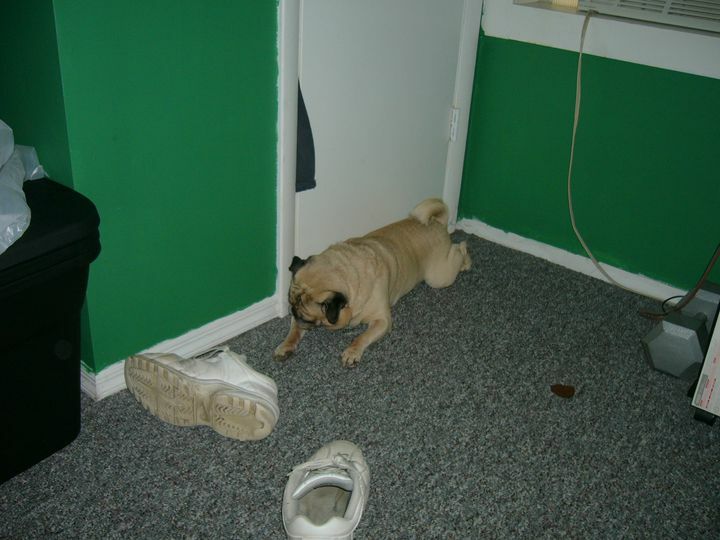 After about 3 minutes of driving, I frantically got on my cell phone and called the SPCA to ask if anyone had adopted that pug yet (remember – I was there 3 minutes earlier… who is going to adopt a dog in a nearly-forgotten hallway that quickly?!). They said no and I told them that this pug was MY dog and I didn’t want anyone adopting him besides me. They said okay, but that I had to come back and fill out the paperwork and pay the required fees. I told them no problem and to wait for me. I finished the short drive home, picked up some stuff, turned around, and went back to adopt Odie. When I went back to the SPCA, they allowed me to sit in the same room as the dog to see if we were compatible. I remember sitting on the floor in a kitchen-like area as someone brought Odie in and left him on the other side of the room. The dog sort of looked at me and I sort of looked at him. I tapped my fingers on the ground and Odie looked at my fingers and slowly started walking over. When he finally reached me I opened my hand with my palm facing up and he sniffed my hand. Odie must have approved of what he smelled because he allowed me to pet his head, his neck, and his back. After a short while, he sat down in front of me and really enjoyed the petting that he was getting. Overall, this went on for about ten or fifteen minutes until the caretaker came back and had to take Odie away. I went to the front desk, filled out the paperwork, paid the fees, and was told that I had to wait several days for my dog to be neutered. Over the next few days I went out and bought all of the doggy accessories that new owners typically get: a brand-new brown collar with a matching brand-new brown leash, a retractable leash (an expensive one because my dog was going to have the best stuff available), doggy toys, treats, dog food, etc. And then came something that I’ll always remember. You know, some people say that dogs can’t smile; that they’re muscles aren’t arranged in their faces to allow for a smile. Well, after Odie explored my apartment for a little while and after we sat on the couch and watched some television while I rubbed his back, it was time for dinner. I know that the shelters feed these dogs dry food for a number of reasons including that it is cheaper and easier to manage. For his first meal at my apartment, Odie ate wet food for what must have been the first time in ages. He went insane after dinner. Now don’t tell me that dogs can’t smile! Sometimes, Odie would like to go into small spaces and lay down. Wherever Odie came from before he wound up at the Monmouth County SPCA, he was definitely well-trained to stay in a crate or a cage. He loved going into tight spaces like you see in that last picture above. 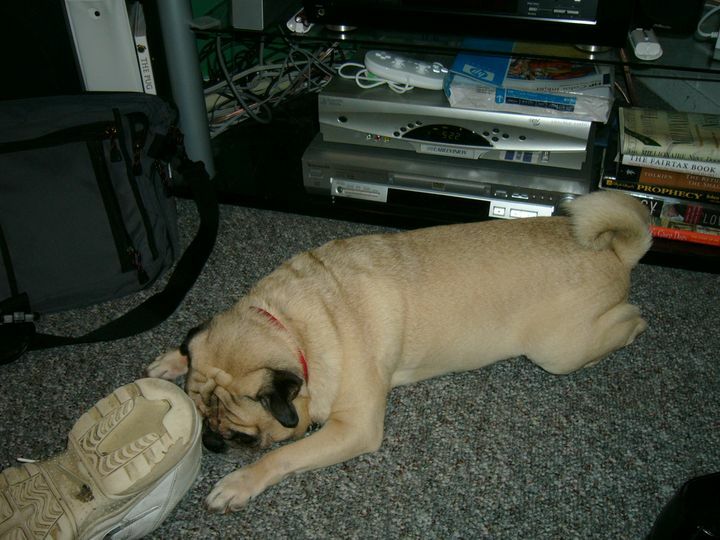 On Thursday, August 30, 2007 I brought Odie to my Mom’s house to see how he interacted with her pug. There wasn’t much interaction, really. 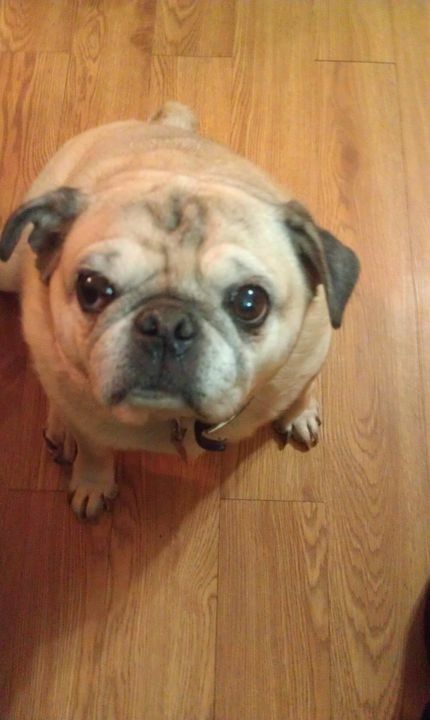 The other pug, Yoda, is your typically pug who just sort of rolls with the punches. Odie was a little leery about being in a new place and walking around a new house, but I was there with him so he was okay with it. My Mom got used to Odie and after spending a few hours up there, I managed to sneak away while Odie was preoccupied with eating dinner or while someone in my family was petting him. That was a tough drive back to my apartment, but I knew that staying with my Mom was the best thing for Odie. Over at my Mother’s house, my Mom and my younger brother bonded to the little guy relatively quickly. From a dog’s perspective, my younger brother and I must have a similar human scent because Odie took to my younger brother. 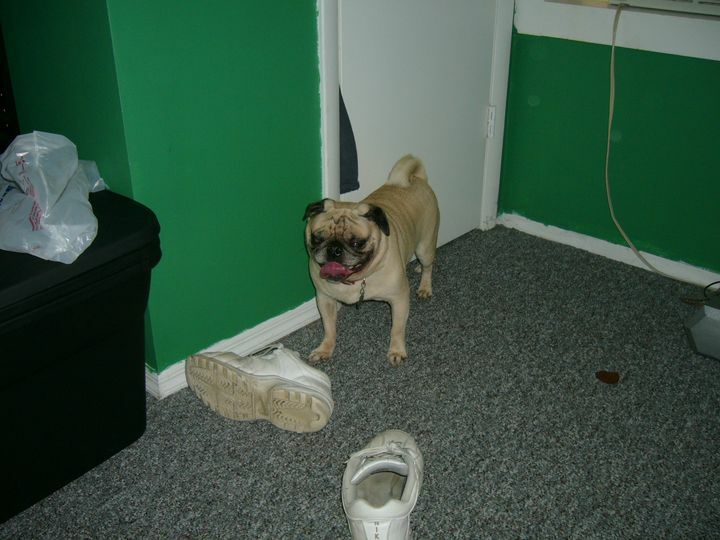 I remember going back up to visit and watching as Odie would bark and get aggravated when my younger brother would leave the living room, go outside, or go into his bedroom with the door closed. Odie loved companionship and he got annoyed when someone that he liked wasn’t nearby. No matter how many months or years went by, whenever I went back to my Mom’s house Odie would come over to me. It didn’t matter if it was Christmas and there were family and friends visiting or if it was just me and my Mom in the house – Odie would come over and sit down next to me. Just like he did in the kitchen area when I went back to the SPCA to claim him from the shelter back in August 2007. That’s what I’ll probably remember and miss the most about Odie – his loyalty. That’s a hard enough trait to come by in humans and here was a dog that didn’t think twice about dropping everything to come sit next to the guy who rescued him from the shelter and gave him a real home for his final years. This past Thanksgiving we all noticed that Odie was coughing quite a bit. My Mom said he had been doing that since the hurricane knocked out the power to her house for 2 weeks. He went to the vet, but Odie didn’t like being bothered with by the vet so the x-rays were mostly inconclusive, though the vet said that the coughing was probably caused by lung cancer. He prescribed a treatment for him in the rare event that it was pneumonia, but that treatment didn’t help. Odie didn’t have pneumonia. He had lung cancer. A week or so before he took his final nap, my Mom started Odie on a regiment of steroids. 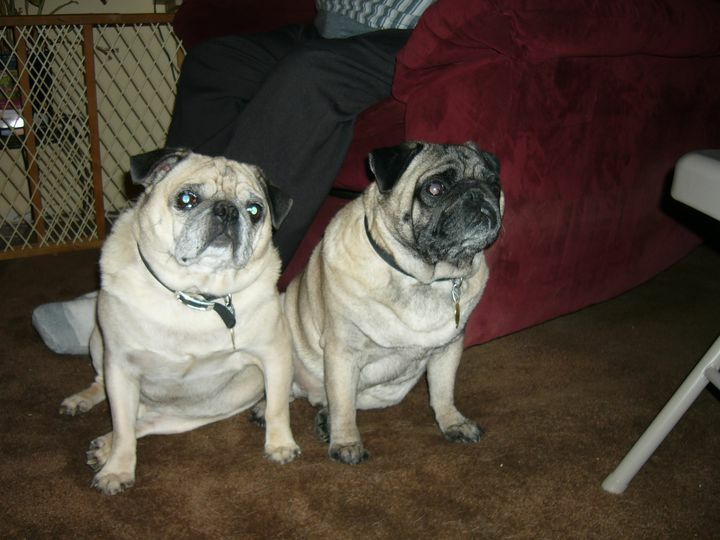 Remarkably, the steroids helped to ease his cough and Odie began eating regular food again. But the easement didn’t last long enough. 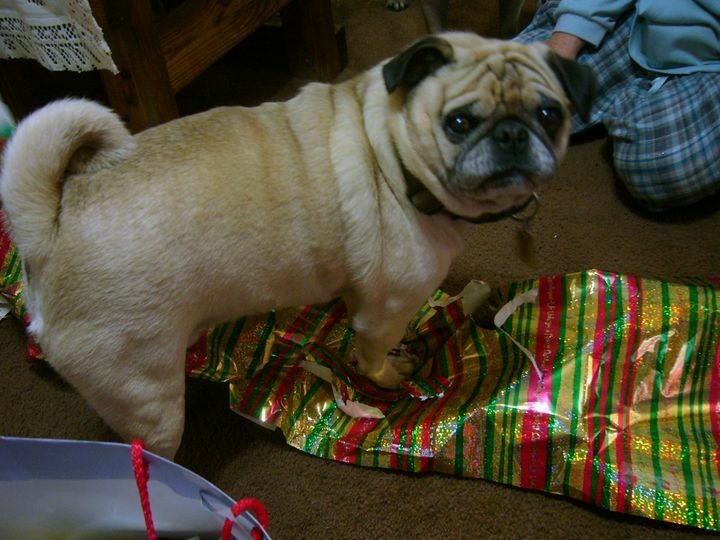 On Christmas Eve, my Mom found Odie in convulsions. My younger brother picked up the entire bed that he was laying in (see the last picture above from a few years ago) and put him in my Mom’s car so she could take him to the vet to get help. Incidentally, dogs have a sixth sense about when someone is helpless and needs to be protected. 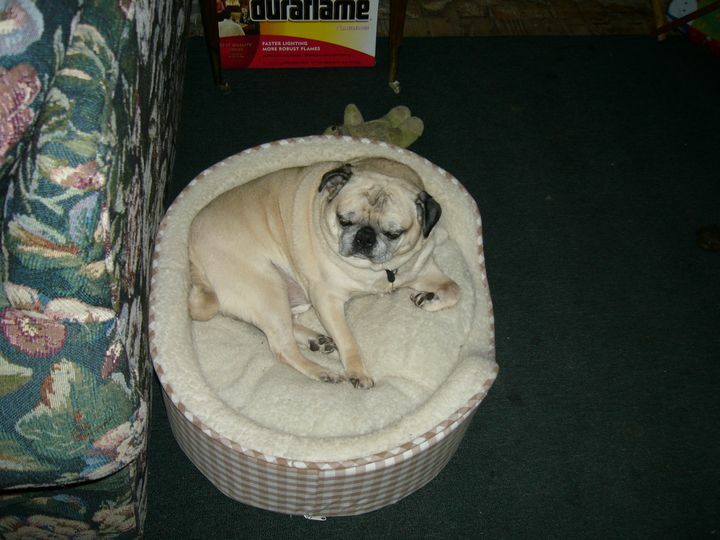 Yoda got in front of Odie’s bed and growled at my younger brother and my Mother when they tried to help Odie. He was trying to protect Odie because he was defenseless. When my Mom arrived at the vet, the vet made it clear that it was time. 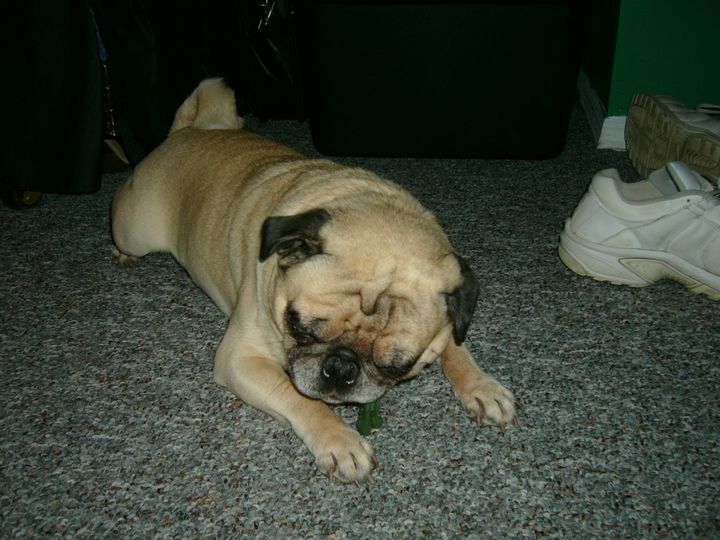 Odie was given one shot that put him into a deep sleep and that allowed my Mother to give him a last look and see him taking long, deep, peaceful breaths. After that, my Mom went into the waiting area as my younger brother’s girlfriend watched the vet give Odie his last shot. My Mom opted to have Odie cremated; the ashes arrived in a wooden box the other day. 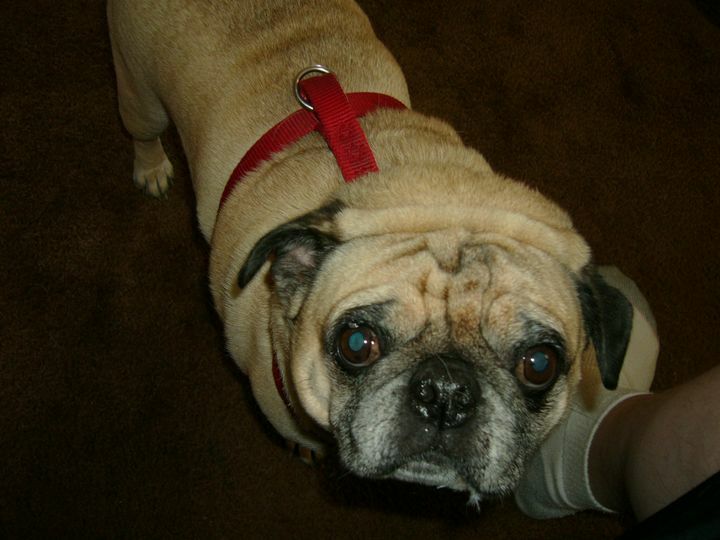 So Odie is gone from this world and, thank God, no longer coughing and in pain from his lung cancer. He was with my family for exactly 5 years and 4 months – not nearly enough time for us to give him all of the love that he deserved, but more than enough time for him to give us every bit of love and appreciation that he had to give. 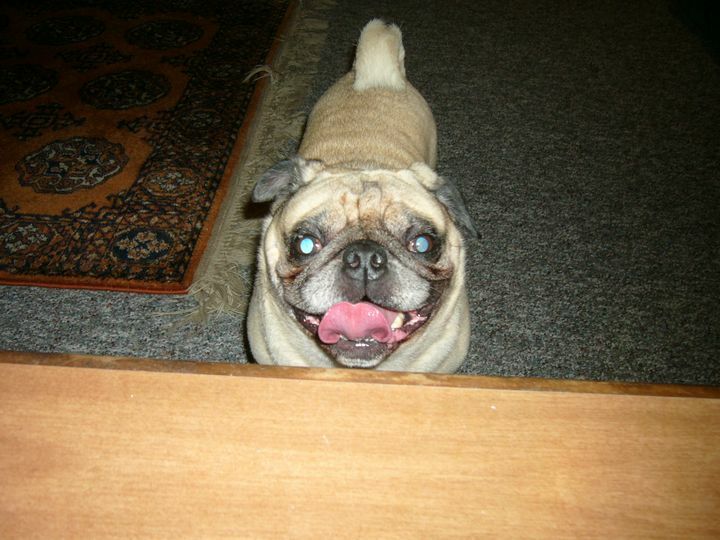 My family and I will miss Odie – he had a great amount of personality and will not be forgotten. And with his big doggy smile. Well, it’s been a short while since I wrote the last student loan debt drop entry back at the end of August. The reason for that is because of some major family and professional events that came up over the last few weeks. Many of these family events were really happy, joyous family activities surrounding my older brother’s wedding. So I was a bit preoccupied with those things to stop and focus on writing about my student loan debt, but taking a break for a few weeks isn’t such a bad thing either! Planning for all of the family and professional expenses from the last few weeks – amid trying to stick to an aggressive student loan repayment schedule – has been an interesting exercise for me. In short, I’ve been able to stick to a basic repayment schedule while certain funds were diverted for these events – and I’ve been able to stick to a basic schedule without dipping into any of my savings account, which is good. For a guy who works at a nonprofit organization during the day and teaches online at night, you have to admit that this is pretty impressive! And this exercise has been interesting because it served to show me how rigid my repayment schedule has been over the last few years. What does that mean? Well, for the last six weeks or so I’ve allowed myself to change my focus from putting every extra available dime towards student loan repayment to holding back on every expense/cost ranging from saving money to repaying student loan debt to purchasing certain, necessary new items for my home, etc. And do you know what this exercise has shown me? It’s shown me that once I repay that United States Department of Education student loan, I’m going to have a good amount of money coming in. No, it’s not going to be enough for me to immediately make an impact on other areas of my financial life (i.e. super saving to bolster my retirement funds, buying a house immediately after paying off the loan, etc), but it’s going to be pretty nice. The trick, though, is to figure out which goal is next. I know what I won’t do once this remaining student loan is paid off, though: I won’t try to achieve all of these financial goals at one time. I think that my story – up until this point and God-willing over the next 12 to 18 months – has proven that focus is the key to achieving financial success. I’ve opted to spend the last few years focusing my financial efforts on repaying my student loan debts and I’ve come a pretty long way; far enough to see the light at the end of the tunnel. When I reach the end of this tunnel, I’m not going to be the dog that caught the fire engine and wonders, “What now?” Nope. Instead, I’m going to have a plan of attack for my next big financial focus. And the great part of this all is that I have a whole year and a half to figure out what that focus is going to be. What about all of you out there in internet land. Do you have any ideas on what my next big financial focus should be once this remaining student loan is paid off? I’d be interested in hearing your ideas! In May 2006, I graduated from Rutgers University with a Masters Degree and $120,720 in student loan debt. Since I started repaying my student loans in July 2006, I’ve repaid a total of $61 thousand in principal to various lenders including the federal Perkins loan program, the New Jersey Higher Education Student Assistance Authority, and CitiBank. I currently owe $42 thousand in principal to the United States Department of Education’s Direct Loans program – a loan which started repayment in July 2006 with a balance of $59 thousand. To date, I’ve repaid well over $30 thousand in interest to these lenders. 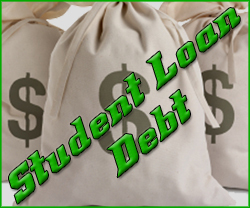 Follow my student loan repayment story on JerseySmarts.com. Congratulations to My Cousin on His Wedding! Yesterday, I was honored to spend the day at my cousin’s Matthew’s wedding. Matt and I were born 5 days apart (I’m older) and have a history of causing ruckus throughout the years. 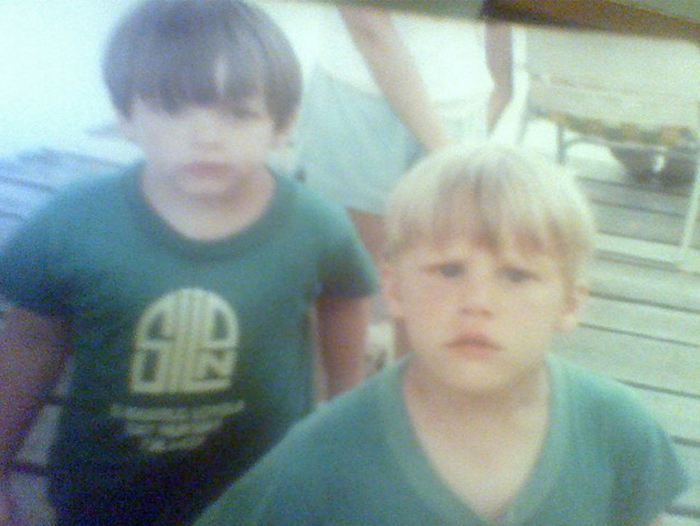 Take this picture from over 20 years ago when we were out on the dock in front of my parents’ house – my cousin is the one on the right side of the picture with the angry look on his face. From all of those years ago through yesterday and into the future my cousin has been one of my best friends. Here’s hoping for his and Kelly’s happiness in the months and years to come as they begin building their family… starting this summer! Congratulations again! This year for Christmas, my family made one of the best decisions that I think we’ve ever made as a family. While we were sitting around for my Mom’s birthday celebration in late October, we began talking about what everyone wanted for Christmas this year. I’m sure that you have a similar conversation in your family so that everyone knows which presents to buy. It’s a fairly common occurrence, I think. While we were beginning the conversation, I said to my Mom, “You know, I don’t really want anything. You don’t have to get anything for me.” And then my older brother jumped in right away and said, “Yeah, me neither. I don’t want anything.” And after that an entire conversation ensued about not purchasing gifts for anyone this year. Our rationale was that we each had different financial goals that we were reaching towards so spending a few hundred bucks (or, very likely, much more) on Christmas gifts that no one was really looking for would be a waste of otherwise scarce financial resources. Frequent readers of this blog know what I was saving up for this fall/early winter. My older brother is in the process of saving money to buy a house with his fiancée, my younger brother is in the process of paying off a new truck that he bought, and my Mother is in the process of paying off her mortgage and some consumer debt. After having this conversation, we all decided that the best thing to do was to celebrate Christmas with family and friends and leave out the excessive spending on superfluous gifts. So last Friday night, my Mom hosted our family and extended family for her annual Christmas party and it was a great time as always. Then on Saturday morning my older brother made breakfast and we enjoyed not spending a ton of money on otherwise unlooked for presents. Except for my younger brother, that is, who swore up and down that we left that conversation back in late October with the idea that we might not buy presents. This, of course, means that he was either lying through his teeth about not remembering how we left the conversation last October or that he wasn’t paying attention when we decided to not buy anything. Anyway, it doesn’t really matter if only one person didn’t stick to the rules of not buying anything, I guess.